iHome iDM5 Wireless Keyboard—Not For Your Desktop Mac! Well, I really stuck my foot in it this time. I got this really interesting keyboard from the fine folks at iHome to review. I saw from the included documentation and the notes on the outside that it was a Bluetooth keyboard (among other real neat things — more later). It was there that I put on my assumption (dunce) cap. I just assumed that if it was a Bluetooth keyboard, it was most likely battery operated. I even showed it at a local Mac user group meeting after “charging” it overnight. I threw it in my bag and brought it to the meeting. I set it up on the table and it didn’t work! I had to plug the external “wall wart” into the AC power socket to fire it up. I thought, gee, it was a dud and I should contact iHome to see about a replacement, which I did later that afternoon. Imagine my surprise when I got a quick reply from the marketing rep at iHome that it WASN’T a cordless keyboard! It had Bluetooth capability, but most likely because of the power required by the amplifier for its speakers (more later), it really wasn’t practical to put a large battery in the thing. It would have priced the keyboard totally out of the market, and would have made a substantial keyboard downright heavy. Boy, was my face red! But this isn’t about my stupidity and embarrassment! I could fill volumes about that! No, it’s about a really neat Bluetooth keyboard with USB ports (for charging USB-chargeable devices), an audio amplifier and decent quality speakers, and Bluetooth connectivity of not only the audio functions (you can play music from a Bluetooth-equipped iDevice through the keyboard’s speakers), you can use it as a speakerphone, AND you can use it as a Bluetooth keyboard to enhance your typing (and maybe even your dancing and dining) pleasure with the aforementioned Bluetooth-equipped iDevices. In fact, due to what some might call a design quirk (more later), it’s really not suitable for desktop computer use. iHome calls this an Executive Space-Saver Station. 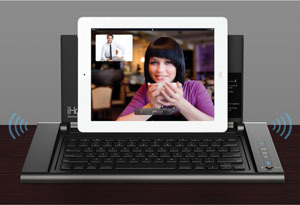 With more and more executives tossing aside their desktop and laptop computers for the convenient and stylish form factor of a tablet device, the classy industrial design of the iHome iDM5 Wireless Keyboard would look great on executive row, and would make a tablet device far more practical for everyday use. It’s a chiclet-style keyboard, much like what you’ve been used to on MacBooks and MacBook Pros (as well as the current Apple wireless keyboards). The action is satisfactory, the feel and response are good, and other than missing a numeric keypad, it’s a really nice keyboard. A smoked plastic lid covers the keys when not in use. When the lid is open, it’s perfect for supporting your iPad, or other wireless devices. There are special details molded into the plastic that hold your tablet/iDevice in place. For smallish speakers, they do a remarkable job with acceptable bass response, thanks to the SRS TruBass® technology, and they deliver clean highs, too. They are also capable of playing quite loudly, yet cleanly. There is a switch on the front panel to select between the analog audio input (non-Bluetooth devices like the iPod Classic, for example), which requires a 3.5 mm subminiature stereo patch cord (not provided), or Bluetooth audio. Most iDevices and their competitors, including most smartphones, can use their Bluetooth functionality to transmit music to a Bluetooth receiver, permitting audio playback on an external device. You can either go to your iDevice and locate a tune, or when you hit the Play button, as long as your iDevice is properly connected to the external Bluetooth device, the music seamlessly plays from that external device. If you hit the Play button on the keyboard, it normally plays the first song (organized alphabetically) stored in your device. There are two USB ports on the keyboard, though they are not used for the usual USB things. Instead, they are used for a single purpose: charging devices that can be charged through their USB port, such as iDevices, other smartphones, other audio players, and so on. One of the ports is also configured, through a switch, for firmware upgrades. Audio playback from other Bluetooth-equipped devices (play your music through your iHome wireless keyboard. With the answer/end buttons and an integrated microphone, you can use your keyboard as a hands-free speakerphone. Bluetooth pairing was a breeze. There’s a button on the function key row that, when paired with an iDevice, lets you enter text using the iHome iDM5 Wireless Keyboard. These are all the pluses. As with all devices, there are a few minuses, too. First, the cord on the “wall wart” power supply is too short. If your keyboard has to be tethered to an AC outlet, a longer cord would go a long way toward being able to conceal it. I know the USB ports are supposed to only be for charging other devices, but it sure would be nice if you could plug a mouse into one of them, freeing up the USB ports on your desktop Mac for other things (for those Luddites among us who still use corded rodents). This is only a very minor quibble, but when the keyboard tray is opened, it opens to a fixed angle. Hopefully that angle is acceptable for viewing your iDevice’s screen while you’re typing. This is perhaps the only deal-breaker of the bunch, but when the keyboard cover is open, its hinged lid may interfere with your monitor, as it sits fairly high (maybe 6-8 inches). There are three small screws in the hinge area, which you could remove, allowing you to detach the cover from the keyboard. Of course, this might do bad things to an otherwise surprisingly good one-year warranty, and probably won’t look very good. Maybe you could elevate your monitor a few inches? But this was supposed to be a keyboard for your iDevices, right? In regular use, the iHome iDM5 Wireless Keyboard was a valued companion in my computer room. The speakers were really nice, and didn’t take up any additional space. Once initial Bluetooth pairing was accomplished, no additional problems were noted. When I powered up my desktop Mac, I pressed the power button on the right side of the keyboard to bring it up. That space, by the way, is shared with the Bluetooth pairing button, and the hands-free speakerphone controls. The same goes for my iPhone 4. Setup was a piece of cake. The rest just worked. The enclosed documentation was short and sweet, though I did find it odd that the quick start guide for the Bluetooth functions was much more detailed than the similar descriptions in the main product manual. It’s usually the other way around. I’m a technical writer by profession, and notice these things. This could be a great addition to your home computing environment, especially if your intent is to dedicate this keyboard for use with your iPad or similar tablet, or even an iPhone, smartphone, or an iPod Touch. As a keyboard for your main desktop computer, consider the height of the keyboard cover before you plop down your $149.95. If you can live with these limitations, you may just fall in love with this Swiss Army Knife of wireless keyboards. I’ve had iHome products in my home for years. I bought one of their first iPod/clock radio combos a long time ago. It was one of the better-sounding clock radios on the market at the time. It’s still working great, though it does lose about a minute a week (and has from day one). iHome has found that sweet spot of interesting upscale (not cheap) and well-designed iDevice accessories, and based on their extensive product portfolio, they’ve done pretty well. 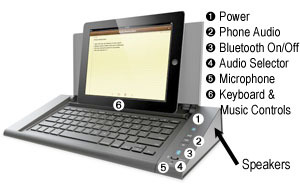 I give the iHome iDM5 Wireless Keyboard a conditional MyMac.com rating of 8 out of 10, the condition being that this keyboard must only be used with portable wireless devices and not a conventional desktop computer with monitor. Used with a desktop computer and monitor, I would rate it much, much lower.